Somaliland held on 13 November 2017 what they promptly trumpeted as their free, fair and peaceful election, and typically indulged in their usual unrestrained triumphalism and endless self-congratulations. While no one in Somalia is fooled that all that glitters in the enclave is gold -and that goes very much for this election- it was to be expected that some foreign commentators not knowledgeable about the realities in Somalia would be mesmerized by its eye-catching election show and make hasty ill-informed judgments. Some have prematurely hailed the one-clan enclave as a role model to be emulated by the rest of Africa. All the same, one has to give it to the secessionists that this was unquestionably a well-organized and staged election; but that is not enough to make an election an epitome of democracy which mean much more than voting. Once the polling was over, this exercise amounts deep-down to a hollow outcome. International observers were quick to report on their return of serious and widespread electoral irregularities. 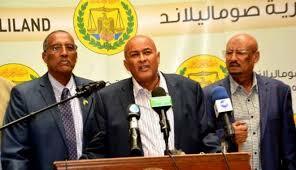 The Wadani opposition party listed a litany of complaints, the most serious being stuffed boxes with false ballots. Apart from voting irregularities, the most serious concern as pointed out by the Wadani party is their valid allegation of an unwritten electoral collusion between two leading sub-clans of the ruling Isaaq clan in which the presidency is to rotate between them by pooling their votes for their chosen running presidential candidate from either of these sub-clans (this time Muse Biixi from Kulmiye) and thus outvote the candidate from the third rival Isaaq sub-clan (this time Abdirahman Ciro). This is borne out by the result of the election as announced. I would like to go beyond this election spectacle and focus on the grim realities behind this facade. Needless to say, the role of non-Isaaq clans in the territory is limited only to voting for presidential candidates from the ruling clan but are otherwise excluded from political power whether they subscribe to the secession or not. As it is, power within the enclave is clearly monopolized by the Isaaq clan and within them duopoly dictates. This is the very practice which drove Professor Samatar mad and made him fulminate against the South when he lost the Presidential election. Duopoly alas is also alive in the north and avidly practiced in Hargeisa. This was not an election in which one party won and another lost on the merits of issues but the defeat of one sub clan, which expected their man to win, at the hands of two other sub-clans conspiring against it. The deep cracks it leaves in its wake cannot be easily papered over by the incoming president. What prevails is a tinderbox situation with all its risk to ignite until the deprived clan gets its turn to rule which is a moot point. An election, if it has to be free and fair, should be rooted in the overarching principles of democracy, human rights and good governance, all in short supply in the enclave. For the secessionists, their elections is not about upholding these principles but to use it as a cynical show to cast their enclave as a paragon of democracy in order to hoodwink the international community how much different they are from lawless Southern Somalia and how much they deserve recognition That is why they dread nothing more than a stable democratic Somalia once again emerging from its ashes which they see as detrimental to their cause. This election was therefore first and foremost a contest for the presidency among the ruling sub-clans as secondly as a show to impress the international community to solicit the elusive recognition they crave. Those outsiders, who warm up to the enclave and cheered its election spectacle, should open their eyes to the reality behind this election façade. For a start, they should know there is no “Somaliland” to which its inhabitants all belong. Among the five clans of northern Somalia (former British Somaliland), only the secessionist clan subscribes to the breakup of Somalia. Specially, we, the kindred peoples from Khatumo and Makhir, whose regions Sool, Sanaag and Cayn (SSC) constitute close to half of the geographical area of former British Somaliland, are unionists and have nothing to do with Somaliland or its secession and election. Having joined the union on our own free will on first July 1960, no outsiders, least of all a fellow Somali clan, can force us under duress to abandon or surrender our inalienable rights to be part of Somalia. The enclave claims to espouse the rule of law and human rights, but pays only lip service. Freedoms of speech, thought, assembly or movement are arbitrarily suppressed. As an example, artists and human rights defenders have been imprisoned for simply performing or visiting Mogadishu; others wearing clothes displaying the Somali national flag are incarcerated; support for the union is criminalized; a TV reporter in Borama who randomly asked people in the streets if they could name the national anthems of Somalia and Somaliland was incarcerated only because all the respondents failed to know Somaliland’s anthem while all gleefully recited non-stop Somalia’s one. A reporter only doing his job paid for the embarrassment and chagrin he caused Hargeisa by revealing how less the people of Awdal care about the secession after all these years. Having failed after 26 years to win the acceptance of the occupied people in the SSC regions to join the secession, or garner international recognition, the ruling clan in the enclave has resorted to making shallow cosmetic changes to its exclusive power monopoly image and dresses it up as an inclusive commonwealth in which occupied clans are equal stakeholders. This was the purpose of a farcical agreement they made with a former deposed President of Khatumo, spuriously claiming that the SSC regions have freely joined Somaliland and henceforth entitled to all the rights thereof. This was a ploy before the election to lure our people to take the bait and vote – an act tantamount to accepting the secession. Few, if any, of our people take seriously Somaliland’s hollow agreement with a deposed President who defected to them, representing no one but himself and roundly repudiated by all sections of the Khatumo society. Clearly, it was a gambit to divide our people, undermine our struggle and deceive the international community. It has done none of that and already fizzled out. Secondly, and in order to cast the election as inclusive, the enclave spent a lot of money bribing or persuading voters from the occupied Khatumo areas (and Makhir) to register and cast their votes, an action they would have used as supporting the secession. While it is true that some voting, altogether in the thousands, took place in few places in Sool (mainly in Lascanod with many of them residents originating from the secessionist clan) what matters most is that close to 99% of the population of Khatumo had neither registered, nor voted nor interested themselves in this election (and none in Makhir State). They simply ignored it throughout Khatumo (and Makhir) and that is their judgment on this election and Somaliland – that we have nothing to do with it. The secessionists base their case for secession and recognition as special recompense for the wrongs done to them by the ousted military regime. No fair-minded person can deny that the clan had suffered, directly or otherwise, during the military conflict between the central government and their own rebel insurgents (SNM). They merit, and indeed get, deep sympathy from the rest of Somalis even if they themselves committed equally horrendous atrocities against other clans in the north, whether in Borama, Kalshaale or elsewhere, without ever admitting to it let along expressing any sorrow. What they always overlook for their convenience is that other clans in southern Somalia had suffered far, far worse than them at the hands of the military regime and more so after its collapse. Their sufferings eclipse what the secessionist clan had gone through. And yet all the rest of Somalia agreed not to be prisoners of the dark past, but bury the hatchet and build a new Somalia where all clans and regions are equal -a paradigm that would in principle obviate the need for secession. This reasoning does not cut much ice with them. The problem with secessionist Somaliland is their self-righteous, self-serving claim to exceptionalism – that their suffering entitles them special treatment. On this rationale, they justify their secession, or their crimes against other clans, and at other times use it as a bargaining chip to exact from Somalia and the international community more than they are entitled to. Whereas equality and justice are all that other Somalis cherish, that is not enough for the secessionists. They want their own enclave where they are more equal than others. This is what underpins the enclave where all the machinery of the “State” and government are exclusively in their hands. If they are still yearning for recognition, they should face the reality. The international community that would not accept Israel’s occupation of Arab lands for more than fifty years, despite its immense leverages with the West, and at all times indisposed to African tribal secessions and their Pandora box consequences, is unlikely to change its long-standing positions on occupation and secession in favour of one Somali clan seceding from their fellow brothers in Somalia simply because they are averse to Mogadishu being their capital. Finally, the reality we would like to present to the outside world is that we in the Khatumo/SSC regions have succeeded to maintain the unity of Somalia all on our own for all the 26 years since the collapse of the Somalia State, and above all the last 10 years since the secessionist launched their colonialist quest to capture our free regions. They might have few isolated military camps in Sool, as one would expect from an occupying power, but beyond that controls or administers no territory or population. From Buuhoodle to Boocame, and all the way to unionist Sanaag, our people are free from Somaliland and remain free and unionists, facts which explain their aversion to be associated with this election in any capacity. Therein lies, we believe, the salvation of a united stable Somalia. And yet, all we had from the rest of Somalia (above all Puntland and the previous federal government), and an international community toeing their line, was one undermining our struggle to defend the union which should have been their duty too. Our final words on Somaliland’s much hyped election, is that contrary to their much vaunted claim to democracy, and far from being a role model for the region as some have voiced, what this election mirrors is its underlying antithesis: it is an Isaaq sub-clans race for the top post, preserving kleptocracy and hegemony over other clans To the extent they are rewarded, that would only perpetuate and deepen the secession and the problems associated with it. It is time the international community abandoned its special micro-managing approach to the enclave in favour of an overall holistic approach to Somalia. Ending the one-clan secession rather than sustaining it with aid is the key to defending Somalia’s unity and stability. The people of SSC/Khatumo would have ended the occupation and hence the secession if they had not been undermined, in their different ways, by Puntland, the federal government and aid donors. As such, the sacrifices we are making for Somalia and the support we deserve should concentrate minds at this critical time rather than indulging a renegade one-clan entity.